Don't crack wise with me buddy. A beige fedora hat for men makes the man like nothing else when wearing an overcoat. This beige fedora hat for men is called the Untouchable after the movie "The Untouchables" and features the classic Fedora hat style that just looks good on everyone who favors style. Made of 100% stiff camel color wool felt. 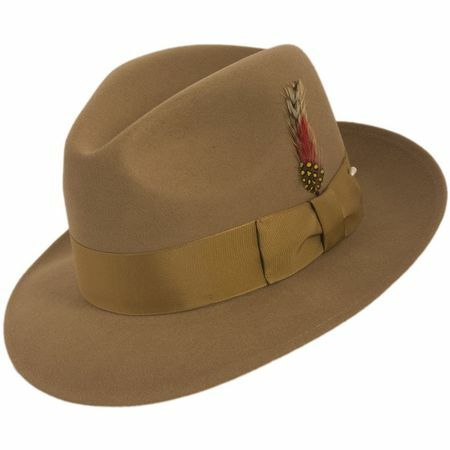 Simply by wearing this beige fedora hat for men, people will begin to see you in a whole new light. Read More about Fedora Hats. Fit your feet in luxury with Belvedere Shoes. If you already have taken the style plunge and got yourself a sharp looking camel or beige color overcoat, well guess what buddy, why don't you go all the way and get yourself a beige color fedora hat and really wow the public. A beige fedora hat has that timeless style that really brings back a time when men dressed like men. It's a look that simply doesn't work with a baseball hat on your head.